When marketing guru and best-selling author Seth Godin wrote We Are All Weird: The Myth of Mass and the End of Compliance in 2011 he probably wouldn't have forecasted the miserable state of politics we find ourselves in today. According to his flattening curve theory it's not going to get better, either. As Big Data gets bigger the political outliers will have a greater share of voice and the normal middle will continue to shrink. In the 1950's marketers, industrialists and politicians were able to personify and speak to a narrow band of consumer-types. Those consumers resided in the normal middle (see below) and could be reached using the limited media choices of the day, which primarily consisted of newspapers, magazines, AM radio and very few television channels. The media that was consumed generally projected the popular, "normal," values of the time on the population. This created a highly concentrated normal middle. The outlier personas didn't have much of a voice because the media of the day was focused on the normal middle. In addition, it was difficult for the outlying groups to organize, grow and thrive because the communications technology of the day didn't easily facilitate it. As time went on communications technology improved, computers and video game consoles started to move into the home and cable and satellite television became available. These innovations helped outlier personas communicate better than they could have in the past and more media choice became available. 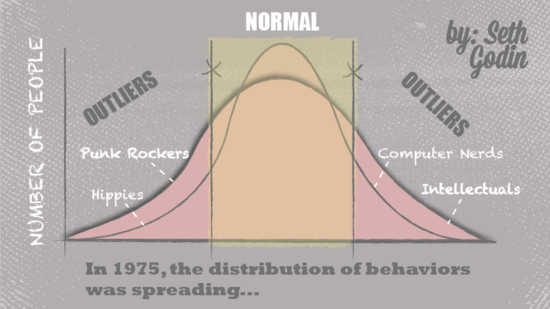 This helped grow their enlistments and led to further dispersion of what Seth Godin refers to as "weird" personas in the outlying areas of the curve (see below). Suddenly, the normal middle wasn't as big as it once was and outlying personas found a voice. This was also the approximate time frame for the introduction of independent presidential candidates. 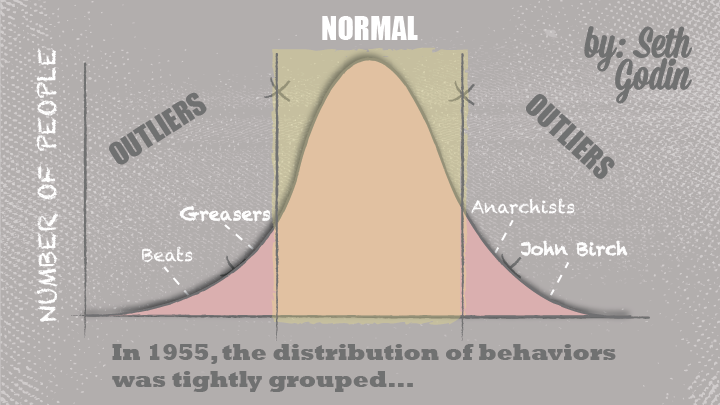 It was a natural progression with the growth of the outliers. Fast forward to the present age and the curve looks very different. Mass, world-wide, Internet and smart phone adoption allows people to connect, communicate and organize in new, effective and efficient means. Social media creates virtual water coolers for the normal middle to further immigrate and congregate in the outlying zones. What were once considered persona deserts now have a larger population than the aforementioned normal middle. As a result, it's likely that future profits, business growth and electoral success will probably require targeting the outlying regions of the curve. Traditionally, politicians have targeted and spoken to constituents whose persona resided in the normal middle - which is quickly shrinking. It's not that they didn't lean left or right. They certainly did, but that wasn't enough to make them an outlier. Outliers organize, recruit and communicate online. As a result, they leave a treasure trove of data and digital body language that can be used for targeting and messaging. Traditional media is less suited to communicate to today's outliers. However, as the outlier populations continue to increase traditional media will likely cater to them more and more. In order to personify and target today's outliers, politicians are embracing Big Data. According to Martha Patzer, former Deputy Email Director for the 2012 Obama for America campaign, her team created somewhere between 10 and 20 thousand email segments. Each one of those segments likely represented some type of Big Data defined persona. It's this type of granular targeting that allows politicians to create the messages outliers want to hear and earn their support. It is one thing for a politician to make a few promises to the normal middle, but Big Data has empowered them to make as many custom crafted promises as they want. It's not a surprise that some of these promises are starting to come to fruition. 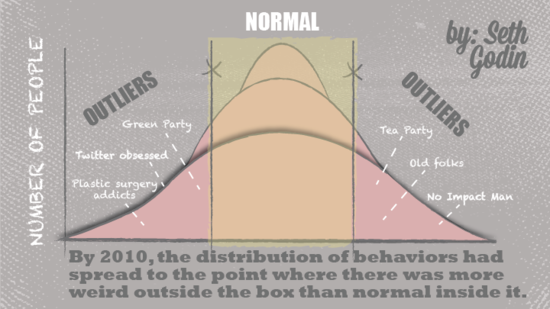 As the Information Age begins to wane in favor of the Social Age, Seth Godin's bell curve of normal and "weird" people will continue to flatten and eventually trough. This will be powered by an explosion in Big Data collection and use by marketers, industrialists and politicians - it's already started, too. Politicians who can best leverage digital persona development, Big Data and context marketing will be best suited to plant, cultivate and harvest tomorrow's outliers. As the outlier populations continue to grow so will the number of politicians that represent them and we'll be left longing for the good old days of the normal middle.